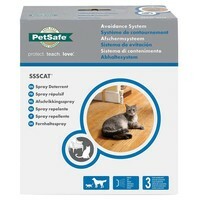 Ssscat Spray Deterrent Training System is an easy to use system that helps set boundaries for your cat. The device works when it detects motion and releases an unscented burst of spray, encouraging your cat to move away from the out of bound area. Ssscat Spray Deterrent is ideal for use on kitchen worktops and tables. The spray can repel cats for up to one metre and the scentless and stainless spray contains a handy adjustable nozzle. Perfect for keeping cats off kitchen counters. The motion sensor is reasonable, my three have not managed to get past it yet and no more complaints about paw prints on the counter tops.